Last year I sat down and wrote an article called 20 Lessons in Music Production I Wish I Knew When I Started. In short, it’s a letter to myself, summarizing everything I wish I could’ve known when starting to pursue music production nearly a decade ago. In that same vein, I wanted to write a letter to myself highlighting everything I’ve learned in building and running a music production school over the past few years because, quite frankly, it’s been the most challenging and rewarding experience of my life so far. It’s me again. Writing to…well, myself. The old me, that is. I’m writing to that somewhat seasoned music producer, the one who was turning 30 and setting out to build the online music production school you always wanted for yourself. Like how making a living in music can be a lot more than just being an artist, in the classic sense of the word. 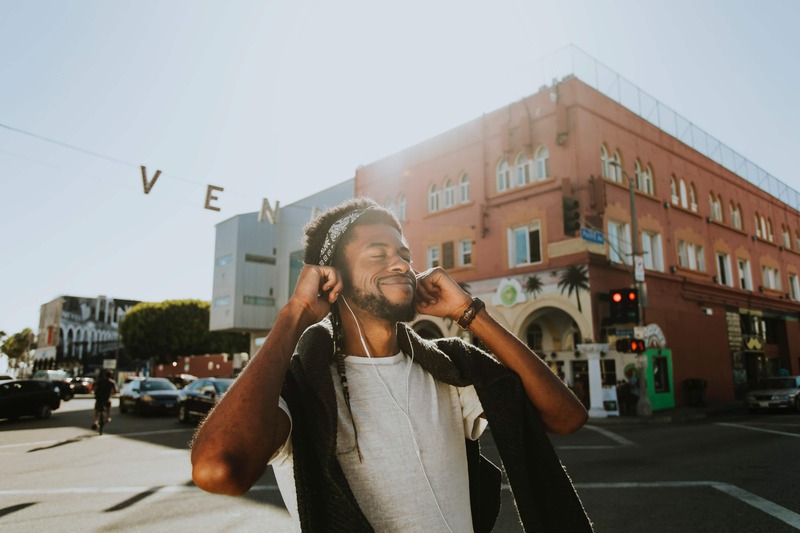 How after you’ll remix artists like Beyonce, Nick Jonas, and Laidback Luke, there is a completely fun, rewarding and challenging endeavor just waiting for you to jump into. You’ll build an online music school. Hell, thousands and thousands of music producers will buy your courses.  Over 60,000 producers will sign up to your email list. You’ll get more interest, engagement, messages, letters, and feedback as a business owner than you ever did as an artist. 1. Create More Value Than You Capture. You’ll get this from Tim O’Reilly, straight out of the Tim Ferris book “Tribe of Mentors” and the message is simple: provide and create more value than you are capturing. 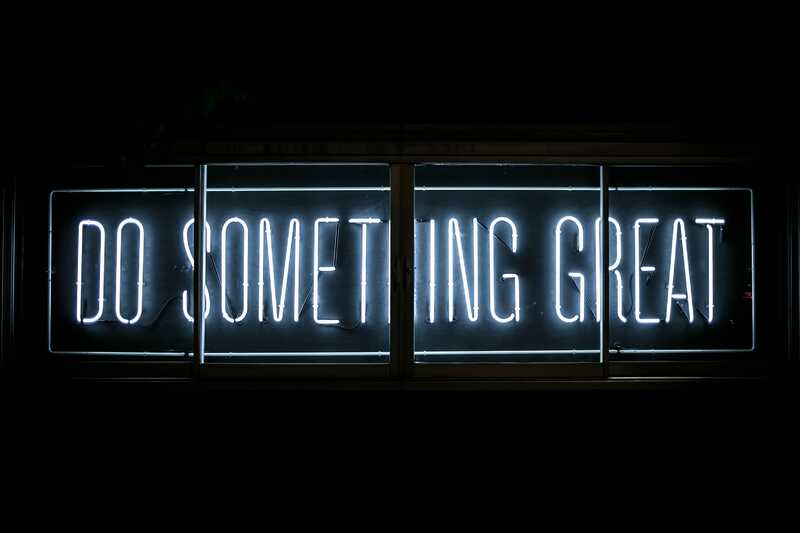 It’s an updated and adapted version of the popular expression “Give more than you receive.” Simply giving doesn’t imply the same level of dedication as creation. You’ll eventually learn this and embrace it. Your Masterclass students will accomplish some incredible things. They’ll get support from almost every major DJ in the world. They’ll get releases on all of the biggest blogs and Youtube channels, as well as placements in most major Spotify playlists. One student will even win the global Ajunabeats talent search. Another student will get hired to his dream job at Youtube as an audio engineer. Other students will play events like Tomorrow Land, Electric Zoo, Beyond Wonderland, Snowglobe or even Burning Man. The amount of students winning remix competitions will be too long to list here. But interestingly enough, you’ll be even more excited about the students finding success away from the big-ticket items. People like Edward, who is starting an electronic music course for teenagers at the private school he works for. There will be Moshe — who is using his production skills to support Jewish recording artists in the US, and Doug — who got to collab with one of his favorite artists after producing music for less than two years. And there’s Dan — who posted in the Alumni Facebook group to let everyone know that he had the courage to submit his first remix contest entry at the ripe young age of 48. This is what happens when you start to provide real value. You couldn’t achieve everything your students have achieved if you had several lifetimes, and that will act as a reminder that you are on the exact path you should be on. Keep at it. 2. Haters are Gonna Hate, So Don’t Stress. This leads to the next point — if you do anything that generates even a remote level of success, people will find a way to hate you for it. This is true far beyond your business. Hateful comments, angry messages, and toxic emails are a common occurrence once your audience reaches a certain level in size. Not to reference Tim Ferris again, but he said that if you have an email list of 1,000 people, at the absolute minimum, one of those people is most likely fairly insane or imbalanced. Scale that across thousands of subscribers (you’ll have over 40,000 at the time of this article) and well, you’ll see how the hateful comments can seemingly multiply exponentially. But the silver lining here is that what you used to chalk up to lack of psychological maturity or perhaps simply anger management issues, you’ll be able take a more spiritual approach in handling. In Don Miguel Ruiz’s “Four Agreements” he says that what people say and do to you is a reflection on them, not you. And with that in mind, you’ll do your absolute best to ignore the haters and focus on what you do best: helping people. After all, if I focused my energy on responding to the haters, I’d never be able to build courses and content that actually helps people’s music progress and sound better. Does that make ignoring the haters easy? Of course not. But you’ll learn that when you prioritize making an impact in this world over defending your ego, everything will slowly but surely start to come together in the best of ways. Besides, who are all these people anyway? In 30+ years on planet earth, you’ve never once written a hateful comment towards anyone on the internet. Keep it that way. 3. Implement a 3-Tier Organizational System. You don’t know yet, but there is a method to your madness. You will eventually systemize this and embrace it, and you’ll realize that you get a lot done every day because of this simple 3-tier system. When you are out in the world, ideas will come to you. Sometimes you’ll be mid-workout, sometimes you’ll be in the sauna, sometimes you’ll be with friends, sometimes you’ll be, well, on the toilet. The point here is to keep a running log of ideas. There are no bad ideas here, it’s a total safe zone. This is an unedited list of absolutely everything that ever comes to mind. It’s sloppy, it’s rough, and it’s meant to be that way. After a few hours or days of rumination, some of the ideas from the Tier 1 notepad of ideas will make the cut to Tier 2, which is essentially a glorified to do list. You’ll keep a physical notebook on your desk at all times and if an idea or task makes it to this notebook, it will eventually get done, no questions asked. This list can get lengthy at times, but you’ll make a new one each week or two. If you ever question what you or your employees need to do today, all you need to do is look at this list. Each day, you’ll wake up and review your Tier 2 list of tasks and from there, you’ll simply segment out the appropriate time needed to get certain tasks done today. You’ll also keep a Google calendar with any meetings or engagements up to date. The end result will showcase exactly what you will be doing that day and when you’ll be doing it. As the third tier of the management system suggests, this is all about showing up. You’ll learn that scaling too fast and setting ridiculous goals takes all the fun out of running a business. Instead, you’ll set reasonable, achievable goals and break this down into a day by day, hour by hour system. The best part here is that all you need to do is show up. If you show up and put in your best effort, everything will continue moving in the right direction. Like anything in life worth doing, you can make progress by instituting good habits. The best habit you’ve ever implemented is simple: be consistent and show up every day. The truth is, your entire life is a system of strategies and techniques to avoid the worst version of yourself. You know, the version that wants to watch netflix and order Indian food every single day. So again, stay consistent, and show up. 5. Let Go of the 9-5 Mindset. The idea that you can clock in and clock out at a specific time each day just isn’t a reality. And though you’ll do your absolute best to not work late at night, and to entirely avoid work on weekends, sometimes that just isn’t possible. You’ll work during holidays, sometimes your site will break late on the weekends, sometimes a deadline is a deadline and nothing will get done until it gets done. At the same time, this also means that you can enjoy life on a different schedule. Want to spend 2 hours at the gym in the middle of the day? No problem. Want to fly to Croatia for a week with music industry friends? Done. Want to go to Thailand for 3 and a half weeks with your wife? Totally doable. Want to play golf at noon on Wednesday? No one can stop you. Letting go of the 9-5 mindset means you can live and work on your own terms. It can certainly be difficult at times, but overall, this is totally worth it. 6. Plan to Work More Than You Ever Have. When you did work at a 9-5 right after college, you rarely put in more than a 40 or 45 hours of work per week. Some would argue that your “work-life balance” was quite nice. But in reality, you were pretty miserable. Since starting your own business, you’ll regularly work more than 50 hours, sometimes way more. The kicker here is that you’ll get to do it on your terms, and the payoff will be worth it. In fact, the more you work, the more you’ll help people and the more your business will thrive. Right after you get laid off from your corporate job, times will get tough. You’ll live off savings and eat a lot of canned beans and almost never go out for dinner. But everything comes around, because in 2018 alone, your business will make more than triple what you made in all four years that you worked in Corporate America. 7. Surround Yourself with Positivity. Eventually, you’ll learn that the popular saying “You are the average of the five people you spend the most time with” is mostly true. But it goes beyond people. The books you read, the movies you watch, the podcasts you listen to, the food you eat…everything you do in life can push or pull towards a positive place if you let it. Once you embrace this, your mental state will be much better. In fact, you’ll develop an intuitive sense for who to spend time with based on one simple question. Once you’ve hung out with someone, you’ll ask yourself — “Do I feel better after talking and hanging out with that person?” If the answer is yes, you’ll continue seeing them. If the answer is no, you’ll most likely move on and not make the effort to hang out again. You’ll be amazed how simple yet profound this type of relationship management can be. 8. Yes, It Gets Lonely, Sometimes. Overall, those feelings of loneliness will be fleeting. Remember, any time you are feeling lonely, just pick up the phone and call a friend, or talk to an employee or freelancer. 9. You Can’t Do This Alone. The point here is that a team is more than necessary, it’s a requirement. 10. Read More. F*ck Complacency. Whenever you feel like you’re running out of ideas or even feeling a bit hopeless, you’ll eventually learn that you can turn to the written word. There are so many people that have accomplished way more, who are significantly smarter than you, that have written books about almost everything. It’s times like these that you will reach for a book, and as a result, you’ll gain excess motivation and fill your head with stimulating, thought-provoking concepts that dictate the direction and strategy for your business as a whole. You’ll even publish a blog post about your top 40 must have books for music producers. There was a time when every single email, every invitation, and every opportunity was something you’d gladly say yes to. After all, what could be better than working (in any context) in music? Unfortunately, this is not sustainable, and you’ll slowly start to burn out before you realized that saying no is JUST as important (and sometimes more) as saying yes. Ask yourself “Does this feel right? Does it truly excite me?” and you’ll never go wrong. At the end of the day, you’re just a dude who enjoys sitting down and talking about the mysteries of life. You’re a great person to have a beer with. You try to keep your ego in check and stay as real as possible. For that, more than anything, people will admire you, both in personal and business relationships. So, keep it that way. Staying genuine will be one of the best business investments you’ll ever make. Running an online business is also about creating trust. If you can do that, you’ll encourage not just any customers, but the right type of customer — someone who is fun to work with, positive, inspiring and like-minded. Simon Sinek is a big proponent of this. You’ll watch his video ‘Find Your Why’ sometime in 2014, and it will stick with you. 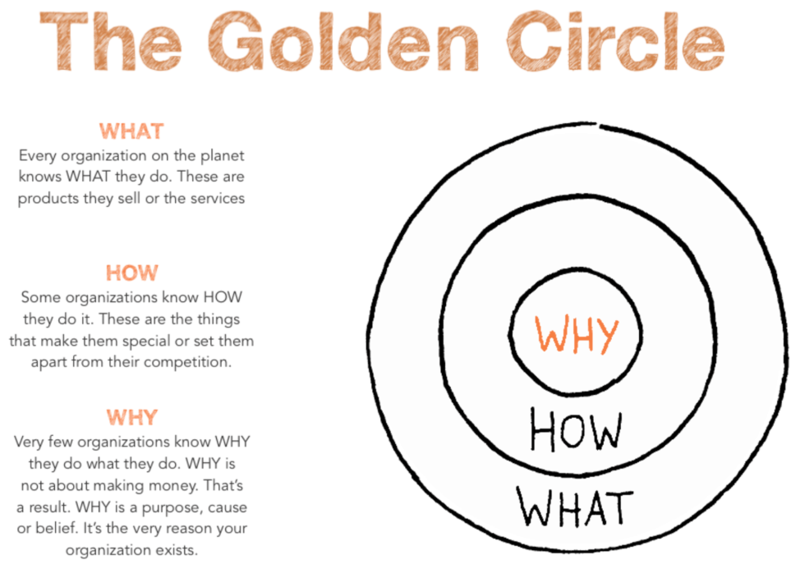 The Golden Circle suggests that the majority of companies know exactly what they make, but very few are able to communicate why they make it. It’s a complete flip of the traditional script that the majority of companies use to sell their products. Most companies list their features, their competitive prices, the benefits of their new product. And guess what? As consumers we’re sick of it. We identify with authenticity and companies that can effectively communicate their purpose. • You believe in music and art. You’re an artist first, and just happen to be good at teaching. • You believe in the freedom to control your day to day, and not having to answer to any boss. • You believe in cultivating a team of energetic, smart, like-minded, passionate, artistic people. That is your “why”. Don’t forget it. This should go without saying, but creating amazing products should be (and will be) your absolute main focus. 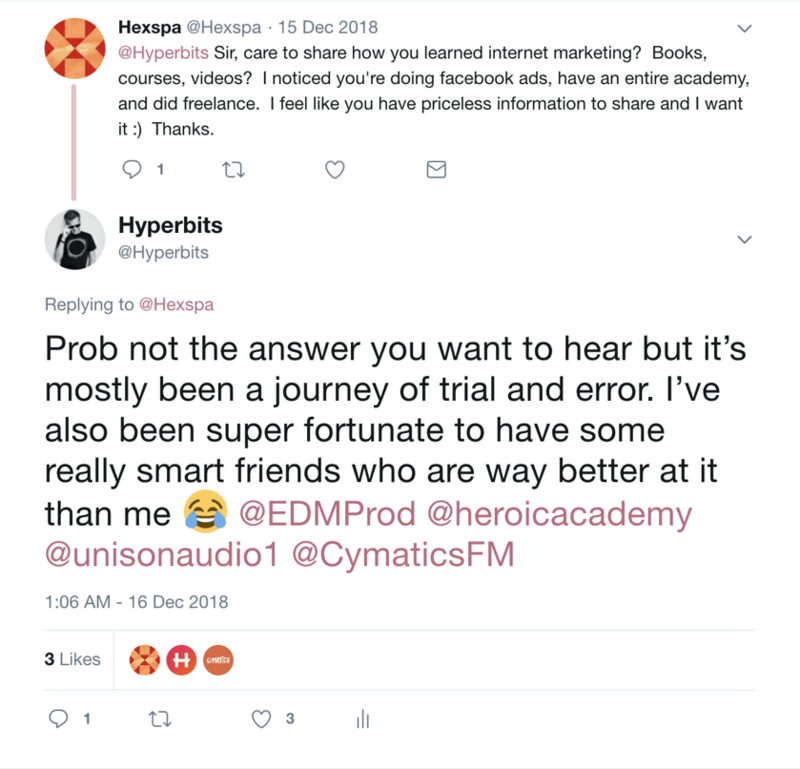 The entire Hyperbits online school started as an attempt to build the school you wish you could have attended when you needed it most back in 2010-2014. Don’t lose sight of that. A school that is actually taught by artists in the music industry. A school that is affordable and didn’t require you to move to NYC, San Francisco or LA. Follow this same level of integrity with each product you create, and your company will be just fine. 15. Keep It Simple. Live by the 80/20 Principle. Also known as the Pareto Principle, this rule suggests that 20 percent of your activities will account for 80 percent of your results. This is why it is ok to double down — start with one thing, and do it very well. You don’t need to do anything complex or complicated (in fact, music is very similar in this sense. Very often, the more simple the idea, the better it is received commercially). It’s often harder to purposefully and masterfully convey one simple idea than to attack many different things at once, half-heartedly. Simplicity will be your guiding light, and the more you can stay on this course, the better your business will be. Think about it. Do you really need 20 different products? Do you really need complex funnels and email drips? Could that stuff help? Maybe. But the amount of effort needed to execute those things is almost never worth the effort. 16. Keep Costs Down but Invest When Necessary. In a world where startups are bragging about their fancy office space and amazing company perks like cold brew coffee, ping pong tables and kombucha on tap, it’s easy to get in the habit of spending, spending, spending. Eventually, you’ll learn to differentiate between wasteful spend versus necessary investments. You’ll always air on the side of frugality and thankfully so (maybe thank your parents for that, by the way). This will keep you out of debt and do a lot for your general stress levels. Be smart with your money. It’s ok to save. In fact, keeping at least 3-6 months of payroll in your business checking is totally cool. People: This is by far the most important. Invest in the right people and the right team, and the everything becomes significantly more simple (and fun). So whether this is in reference to more instructors, music producers, accountants, freelancers, joining a mastermind, etc. — everything you do revolves around people and their ideas. Don’t take this for granted. Tech: Air on the side of caution here, it’s easy to want the latest and greatest features, but shoot for functionality as opposed to the greatest tech features. Much like in music, simplicity will go further than anything else. On this point though, if something can be automated with a service, just spend on it. You only have so many hours in the day, so anything that automates itself is worth its weight in gold. Education: If I ever think about buying a book or course, I just go ahead and buy it. The information I gain from either always trumps the investment I made into it. 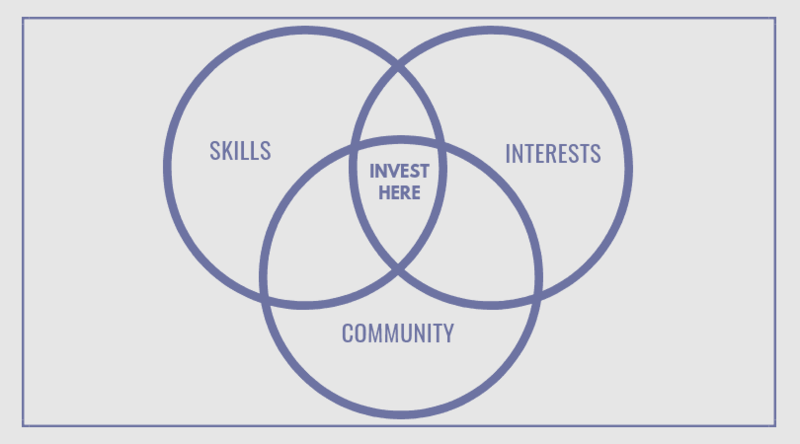 Outside of business, you’ll develop a personal investment philosophy: Invest at the intersection of Skills you want to build, your Interests, and Community. Focus on throwing yourself into that environment and creating as much value as possible. 17. Define Success for Yourself. Everything else, literally everything else, is just noise. 18. Your Health is Still (and always will be) the #1 Priority. Somewhere in your mid to late 20s, you realized that health is the #1 priority of your life. You will not sacrifice your standards of health for anyone or anything, regardless of the opportunity or predicament in front of you. To repurpose what you said to yourself last time you wrote an article like this, here’s a reminder of what you need to remember, with a few additions as well. As the years progressed, things started to catch up with you. Drinking was more of a distraction than anything. All that sitting you were doing when making music started to reappear as lower back problems. By not moving around that much every day, your strength started to suffer. You started to gain weight. You got more anxious. ✓ Go for runs, go biking. ✓ Go hiking, go camping. ✓ Drink a green smoothie. ✓ Stay away from that processed sh*t.
✓ Invest in a standing desk. ✓ Stretch and foam roll, every damn day. Do all this and reap the ridiculous benefits. Plus, nothing inspires you more (in both music or business) than getting away from your computer. So, stay healthy my friend. 19. Partners Help, A Lot. I know, that wasn’t too profound, but those are the reasons you will love working with partners. Sometimes, once in a while…business really can be that simple. 20. The Work Has to Stay Fun. Let’s face it, you love to work hard. Sometimes, that means pushing yourself, and that’s totally cool, just remember to have fun. Life is too damn short to take everything so seriously. If you’re not having fun, you have to find something else to do with your time. Luckily, you’re having the time of your life, so this hasn’t been too much of an issue just yet. Also, side note — as you grow, you can always hire for the things you don’t enjoy doing as much. Believe it or not, some people actually love the things you don’t love. Some people will even thrive in that environment. Remember this because it will help in the long run. Don’t Stress. Haters are Gonna Hate. Implement a 3-Tier Organizational Management System. Let Go of the 9-5 Mindset. Yes, It Gets Lonely, Sometimes. Keep Costs Down but Invest When Necessary. Your Health is Still Everything.